I find plants fascinating. Like people, their strengths and weaknesses vary. Some are persistent; popping up between cracks of concrete and standing tall after a light frost. Others need to be pampered: too much of anything and they faint or wither. Most of the plants I first met as a child came in cans – canned veggies and fruits. I lived in a large midwestern city filled with houses, concrete and lawns – except for a couple of years when my family moved into a new suburban subdivision far removed from the inner city. One side of our one-acre lot was bordered by a protected wild space that had a creek, pond, various critters and tall grasses – maintained only by nature. That wild weedy space was where I discovered the untamed beauty of landscape and plants. It’s the place I recall as my first connection to nature. It's the sanctuary I retreated to as my family slowly fell apart. It's the haven where I began to think about growing up. The tall grasses hid me from the world. I have been a late bloomer in many parts of my life and gardening is no exception. ...Except for that one time, in my early teens, when I planted some marijuana seeds in my mom's yard. They grew large enough for the neighbor who was a sheriff to notice and promptly inform my mother what was growing in her back yard. Neither bought the science experiment story. After a wild ride through my teens and twenties, I settled down in the Pacific Northwest, submerged in college textbooks for many years. I decided that vegetable gardening offered a new kind of learning. A little bit of mentoring from an older neighbor, a few gardening books, and hours kneeling in a small plot of soil, resulted in my first crop of onions, some tomatoes and potatoes. That was all it took - growing food led to growing herbs which led to wildcrafting which led to studying plants as a hobby. Cooking and preserving my garden's bounty was a natural extension. Weaving baskets and making paper with native plants just seemed part of the deal. Blending herbal teas morphed into studying and creating herbal remedies and gradually my lifestyle followed the seasons (and the weather), my gardens expanded a bit more each year, and eventually a bedroom became an apothecary for a growing collection of dried plants stuffed into canning jars, recycled bottles of herb-infused oils, and now, bags of dried plants for my latest plant exploration - botanical dyes. You see the slippery slope, don't you? Trained as an educator, I love to share what I know. Thirty years experience of growing, cooking, healing and making with plants includes many mistakes, regular failures, bountiful successes, moments of clarity ("what was I thinking when I planted 36 tomato plants"), and an intimate knowledge of plants. An equally strong curiosity drives me to seek more information, to learn more about plants. My plan is to share all of that with you. 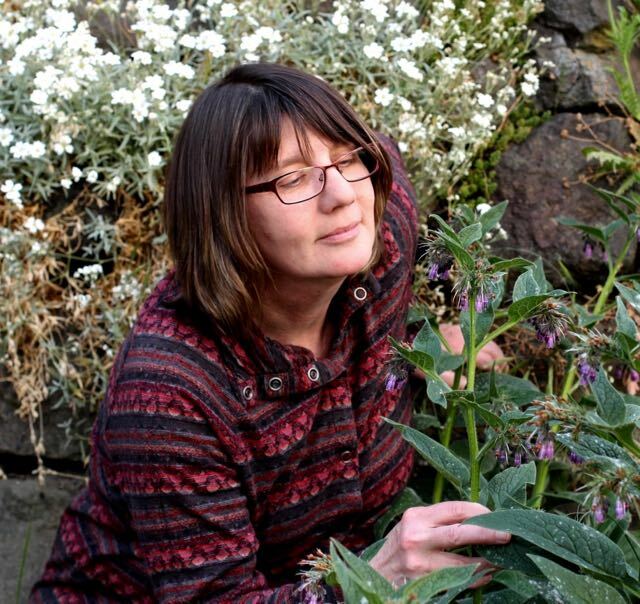 My more formal education includes a Masters in Teaching, courses in Bird Biology, Wildlife Habitat, NW Flowering Plants, Permaculture, an extensive course in herbalism (Western, Chinese and Ayurvedic) and the Master Gardeners program. I am deeply connected to natural world and my hope is to share that connection and appreciation with you. Organic gardener, curious reader, folk herbalist, kitchen witch, adventurous cook, car camper, nature photographer, slow hiker, food lover, achy yogi, dog caretaker, cat servant, wildflower enthusiast, medicine wildcrafter, unsuccessful beekeeper, wine snob, fiber freak, occasional knitter, movie watcher, magazine junkie and chocolate addict. Join my subscriber list to receive a twice-monthly updates of posts and projects. You have no idea how much I dislike spam, and and so I am committed to protecting your privacy.